That question is front and center as conventional approaches to pain control in the United States have led to what some see as a culture of overprescribing, helping spur the nation's epidemic of opioid overuse and abuse. Surgeon Marty Makary wondered why and what could be done. So, Makary, a researcher and a professor of surgery and health policy at Johns Hopkins School of Medicine in Baltimore, took an innovative approach toward developing guidelines: matching the right number of opioid painkillers to specific procedures. After all, most doctors usually make this decision based on one-size-fits-all recommendations, or what they learned long ago in med school. Even Makary admitted that for most of his career he "gave [painkillers] out like candy." In December, he gathered a group of surgeons, nurses, patients and other leaders, asking them: What should we be prescribing for operation X?" "The head of the hospital's pain services said, 'You're the surgeon, what do you think?'" recalled Makary. Makary didn't know. Nor did the resident. And the nurse practitioner, who often is the one who most closely follows up with patients, said it varies. "Wow," recalls Makary of that day when they first considered appropriate limits. "We're the experts, the heads of this and that, and we don't know." After a quick couple of weeks of intense discussion, Makary's group reached consensus and gave its blessing to guidelines setting maximum numbers of opioid-containing pills for 20 different common surgical situations, from relatively minor procedures to coronary bypass surgery. "We're in a crisis," said Makary, explaining why the group didn't go a more traditional route and publish its findings in a medical journal first, which could take months. Sometimes the right number of opioids is zero, concluded the group. Indeed, it recommends no opioids for patients heading home after uncomplicated labor and delivery, or after cardiac catheterization, a procedure in which a thin, hollow tube is inserted into the heart through a blood vessel to check for blockages. For certain types of knee surgery, such as arthroscopic meniscectomy, the guidelines recommend no more than 12 pills upon discharge, while a patient going home after an open hysterectomy could require as many as 20. Optimally, "no one should be given more than five or 10 opioid tablets after a cesarean section," Makary said. Oh, and for cardiac bypass surgery? No more than 30 pills. Tens of thousands of Americans are dependent upon opioid medications. An increasing number are dying from overdoses, both from prescription medication and street drugs. Knowing that, Makary, as well as other surgeons, hospitals and organizations, are taking steps to change how they practice medicine. After all, many experts view the use of opioid prescription painkillers after surgery as a gateway to long-term use or dependence. A study published last year in the journal JAMA Surgery found that persistent use of opioids was "one of the most common complications after elective surgery." In that study, University of Michigan researchers found that 6 percent of people who had never taken opioids but received them after surgery were still taking the medications three to six months later. With about 50 million surgeries that occur in the U.S. each year, "there are millions who may become newly dependent," said Chad Brummett, the study's lead author and an associate professor of anesthesiology at the University of Michigan Medical School. Smokers, and those diagnosed with certain conditions such as depression, anxiety or chronic pain before their operations, were most at risk of long-term use. Each refill or additional week of use makes for a greater risk of misuse, other studies have shown. Additional research points to another reason for concern. If patients don't take all the pills they are prescribed following an operation, those pills can be stolen or diverted to other people, who then run the risk of becoming dependent. Still, there is debate in medical circles about just how effective recommendations and guidelines will be in stemming the epidemic. 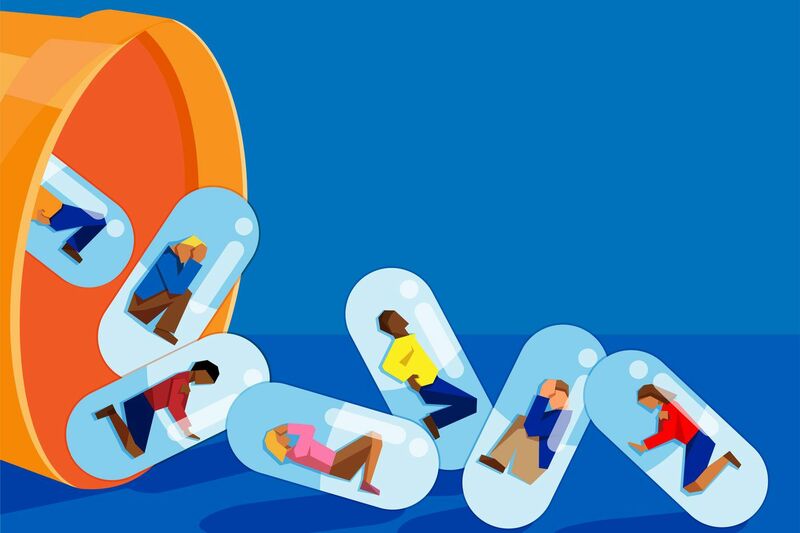 For one thing, some experts worry that if the fight against opioids focuses only on safe prescribing at the expense of seeking alternatives, it may miss the bigger picture. "Are there better methods than opioids in the first place?" asks Lewis Nelson, chair of emergency medicine at Rutgers New Jersey Medical School. "Could you put a lidocaine patch over the wound or is there a better way to immobilize a joint?" Studies have shown that sometimes a combination of ibuprofen and acetaminophen can be just as good as or better than opioids. Alternatives should always be considered first, agreed Makary. Another concern is that guidelines for prescribing relief — even those aimed at short-duration, acute pain, such as that following surgery — have carryover effects on patients with long-term pain. Advocates say all the attention around prescribing limits have made it difficult for chronic pain patients to get the medications they need. Some people even apply these concerns to recommendations about the treatment of acute pain. "It's important for a physician to have the ability, if they feel there's a medical necessity, to write a prescription for a longer duration," said Steven Santos, president of the American Academy of Pain Medicine. "It's challenging to lump all patients into one basket." Lawmakers — desperate to address overdose problems that are destroying families and communities — have gone where they usually don't: setting specific rules for doctors. Legislatures in more than a dozen states, including New Jersey, Massachusetts and New York, have set restrictions, often on the number of days' worth of pills prescribed for acute pain. "States said that since physicians haven't self-regulated, we're going to do it for them," said Nelson at Rutgers. Congress, too, is getting involved, holding a flurry of hearings this spring, and considering legislation that would, among other things, set limits on prescribing opioids for acute pain. The recently passed federal spending bill includes $3 billion in new funding to help states and local governments with opioid prevention, treatment and law enforcement efforts. To be sure, the medical profession has also responded to the crisis — with medical societies and other expert groups offering a growing number of standards for prescribing opioids. Some are fairly generic, recommending the lowest dose for the shortest period of time for acute pain. Some are more prescriptive. None is meant to address the needs of chronic pain patients or those with cancer. And state rules vary. New Jersey's, for example, says patients with acute pain should, initially, get no more than a five-day supply, while Massachusetts sets the cap at seven days for a patient prescribed opiates for the first time. The Centers for Disease Control and Prevention recommends three days. Makary and some other experts say that, while well-intentioned, such durational rules are too blunt. A day's worth of pills can vary, depending on how often the doctor instructs patients to take them. Under many of the state rules, patients could still head home with more than 50 pills. "No one should have 50 tabs sitting in their medicine cabinet" for acute pain, said Makary. Andrew Kolodny, co-director of opioid policy research at the Heller School for Social Policy and Management, supports guidelines but wants states to take their rules a step further. "I don't think the way the states are going at this makes much sense because the issue with overprescribing was quantity, yet they're passing laws around duration," he said. Instead, the laws should require that "if physicians are going to prescribe more than three days, they have to warn the patients that this is an addictive drug and that taking it every day for as little as five days may cause them to become physiologically dependent," Kolodny said. That would create a disincentive to prescribing more than three days' worth of opioid painkillers, he added, and lead to more informed patients among those who need a longer supply. Rutgers' Nelson, who sat on the CDC panel that developed recommendations, said durational rules — like those adopted by the states — can be effective. "I personally think three days is enough," said Nelson. "That doesn't mean pain goes away in three days, but most people get better within three to five days." That said, Nelson called the Hopkins' approach an "excellent idea" and one he has tried to do. "It's a lot harder than it sounds because of the large number of procedures and the diversity of patient needs," he said. To get around overprescribing — or setting one-size-fits-all guidelines — physicians at Dartmouth-Hitchcock Medical Center have a developed their own data-based approach. Dr. Richard Barth, the chief of general surgery at Dartmouth, and colleagues studied 333 patients discharged from the hospital following six common surgeries that included bariatric procedures; operations on the stomach, liver, colon and pancreas; and hernia repair. Surveying the patients, they asked how many opioid pills they went home with, how many they actually took, how many went unused and how much pain they experienced. The data helped them land on a way to recommend a specific number of pills. "If they took none the day before discharge, then over 85 percent of patients did not take any when they went home," said Barth. Dartmouth-Hitchcock now uses that data as a recommended starting point for physicians. Under the guidelines, patients taking no opioid pain pills the day before discharge go home with none. Those who take one to three pills get 15, an amount Barth's study found satisfied 85 percent of patients, and those who took four or more get 30 pills. "We came out with a very easy to implement and remember guideline," said Barth. "We actually called patients and asked them how many [pills] they used. That's what differentiates us from other places." Brummett, at Michigan, says the Opioid Prescribing Engagement Network, a collaboration of hospitals, insurers, physicians and others in his state, has used similar data methods to come up with procedure-specific guidelines. "We've taken a data-driven approach," he said. "We believe patient-reported outcomes are a better way to guide than expert consensus." For his part, Makary admitted it is harder to develop guidelines like those at Hopkins and Dartmouth, but he said the effort is vital. "It's mind-boggling to me" that so many opioid-prescribing guidelines do not specify the procedure, said Makary. "An ingrown toenail is not the same as cardiac bypass surgery."